Shares of the digital image specialist slipped on a weak earnings report. 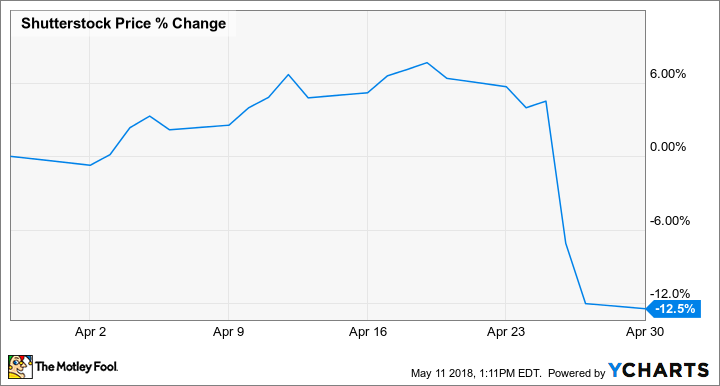 Shares of Shutterstock, Inc. (NYSE:SSTK) were falling last month as the digital image database turned in a disappointing first-quarter earnings report. According to data from S&P Global Market Intelligence, the stock dropped 13% in April. As the chart below shows, that slide came entirely from the earnings report that came out on April 26. Shutterstock shares tumbled on April 26 as the company missed earnings estimates in the report, falling 11.1%. Paid downloads in the quarter were essentially flat, rising 0.5% to 43.7 million, which was perhaps a warning sign; however, revenue per download jumped 16.8% to $3.40, propelling overall revenue growth up 17.5% to $153 million. That result topped estimates at $150.2 million, but the market still punished the stock for a weak bottom-line performance. Operating income in the quarter actually fell 56.4% to $4.5 million as the company stepped up investments in technology and new product offerings, and sales and marketing expenses also ramped up. On the bottom line, adjusted earnings per share fell from $0.31 a year ago to $0.30, which was below analyst expectations at $0.35. CEO Jon Oringer said the company is "seeing promising operational and financial returns on the investments we have made in our technology and product offerings." He also said the company expanded its customer base and was able to enhance customer engagement. Looking ahead, Shutterstock maintained its guidance for the year, calling for revenue growth of 15%-17% to $625 million-$635 million, and adjusted EBITDA growth of 19%-25% to $105 million-$110 million. Analysts currently expect revenue of $632.7 million for the year. Shutterstock shares have essentially traded sideways for the past few years after the surge following its IPO in 2012 fizzled out. The company has struggled to deliver earnings growth during that time, and revenue growth in the teens has not been enough to excite investors. While the company is the leader in the digital image and video licensing business, management's investments have not yet paid off on the bottom line. That may eventually change, but investors have understandably grown impatient and skeptical.